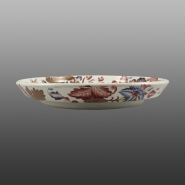 An earthenware cheese stand printed in brown with the Worcester Wheel pattern and overwashed with pink, purple, blue, ochre and yellow enamels. Print reference number P.832 Drakard, David and Holdway, Paul. Spode Transfer Printed Ware, 1784-1833. Woodbridge, Suffolk, Antique Collector's Club, Inc., 2002.